I first encountered Geleni Fontaine doing fierce, high, martial arts kicks early one Sunday morning in New Jersey. I've come to think of those kicks a metaphor for hir activism, which is powerful, dignified, and always delivered with compassion. These days you're more likely to come across Geleni practicing at People's Acupuncture of Brooklyn, which champions services on a sliding scale for seniors, families, people of colour, queer and trans folks, survivors of violence, and everyone in all bodies. Are you in love yet? Geleni's radical vision of the clinic should be a blueprint for all health practitioners and their places of work. Before reading this interview, you might want to check out Geleni's 2008 Nolose keynote (.pdf, 204kb), which might help introduce you to understand where h' is coming from a bit more. For me it was a thrill to witness, a great, loving mix of culture, gender, activism and beauty, and really inspiring. By the way, that's Geleni with h' mother in the picture. I have to say that delivering the keynote at Nolose in 2005 was a big deal for me, it was a turning point. Maybe I'm projecting but your own keynote in 2008 seemed like a significant moment for you too. If so, would you like to say a few things about that? It was a very important moment for me in both public and private ways. It was like being turned inside out in that my identities and the way they interweave were at the forefront, and at the same time the community/ies I was speaking to and for became more intimate to me. That’s the best way I can explain it. It wasn’t necessarily comfortable, but felt good and transcendent. It's funny how much this is all tied into my evolving identity/ies, but then that only makes sense. 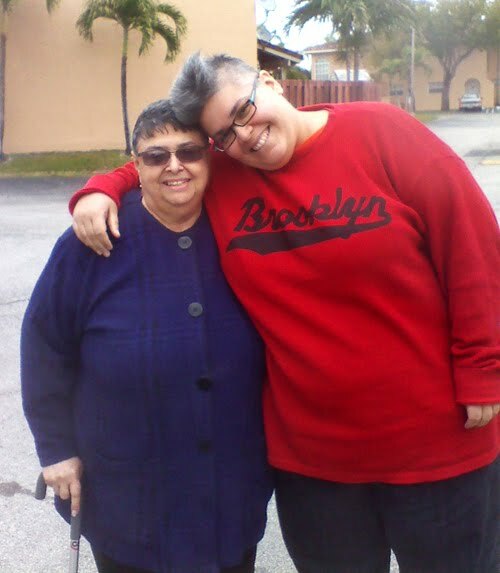 I remember going to the pediatrician with my mother when I was a kid, and the doctor telling my mother we would both die young because we were fat. I internalised that message deeply. Until I was in my late teens I waged a really desperate war with my body that I felt I couldn’t ever afford to lose, or I would lose my life. I remember the first time it occurred to me that being fat might not necessarily mean I had to die young. I was watching the Oprah Winfrey show in the late 80s and she had a fat woman aerobics teacher on stage who talked about being fat and healthy. (She sat on the ground in a wide V-stretch and the audience gasped, presumably because they didn’t think someone her size could do that.) Considering the possibility that I could live without hating myself and trying to change my body was such a new thing. I felt like my head was blown open and I had no one to talk to about it. Technically the first fat community I found was through these dance parties for "fat women and their admirers" in New York City in the late 80s. (I was 19 or 20 years old.) These were slightly creepy events that didn’t fit me. I wasn’t out as queer then and these were very straight spaces which were sexualised in a mean and competitive way. I identified as a woman then and found myself having hard time relating to anyone else around me, but had a few brief affairs and eventually moved on. I came out as a lesbian a few years later at a time when I was coming into my own body in different ways, especially through training in martial arts. At about this time I got hold of a copy of Shadow on A Tightrope, which was the first book about fat acceptance I’d heard of. It impacted me deeply. Something in me softened and hardened at the same time; I felt less alone, but more enraged at injustice. In the early 90s I found an ad in the newsletter of the New York City LGBT Center for a group called, 'Fat is a Lesbian Issue.' It was a support and discussion group for fat lesbians run by Shira Stone and Gail Horowitz. I was at their next meeting and it filled a big gap in me at the time. Today for me fat community is a space that honours me as a queer, trans, person of colour as much as a fat person. It’s also a place that supports my coming out – and maybe coming into – different identities. I look for and try to create spaces that welcome all of all of us. I’m most interested in communities that are both supportive and open to evolution. Like a lot of us I’ve been nourished well on identity politics, but identities shift and grow. 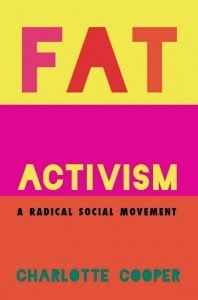 What are your favourite examples of fat activism? Though I think organising and creating culture are in some ways the most crucial kinds of activism, I’m always astounded by the power of simple face to face or very personal moments that make people stop and question everything. 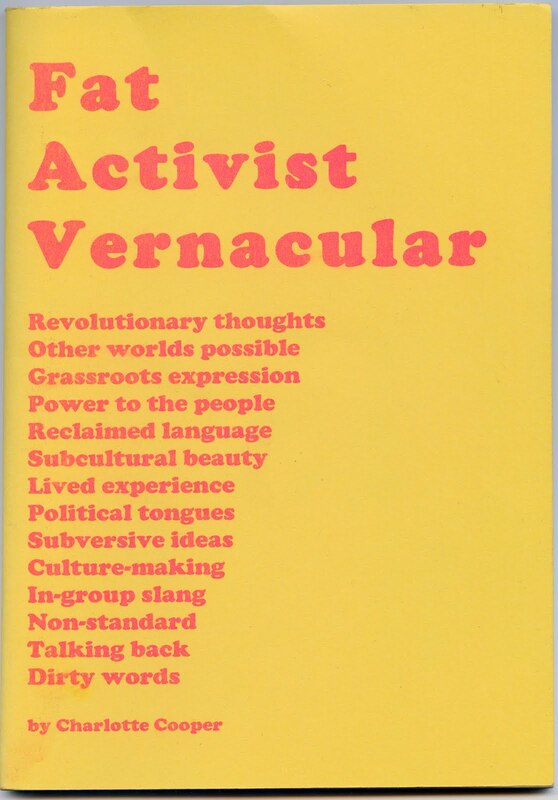 I guess I also define activism pretty broadly. I remember working with a feminist queer group and a bunch of us leading a training for thin women on the subject of fat hatred and thin privilege. As soon as they entered the room we had them try to take a seat in tiny kindergarten chairs (the only seating available to them) that were jammed tightly together with no room to pull them apart for comfort. They experienced what it’s like to be in a place that not only didn’t fit their bodies, but actually excluded them. Several of them had to stand. We had good conversations and education in that space. I like simple actions that artfully upend assumptions and leave people groundless for a minute, like the 'Yay! Scale' created by Marilyn Wann and her friends. People are welcomed to stand on a scale, which instead of giving numbers for their weight pays them a compliment on their bodies. You can see that moment when people are flummoxed, and then they smile. There’s a lot to be said for the power of interrupting someone in the moment and offering a different perspective, especially when face to face. When I’m able to do it I’m always surprised at how effective it can be. And there are certainly times when I’m not able to do it. I’ve learned from working with survivors of violence that we all do the best we can in the moment when facing oppression, and sometimes that means just getting through or past a particular incident, healing and learning from it while we build resources to make change – to me that’s as valid as any other activism. I admire how you bring compassion to your work, even when raising things that would make a lot of people enraged. Is this a conscious strategy? How might activists adopt a more compassionate approach? Thanks! Yup, this is something I try to do. My weird childhood with my family taught me to look at issues from different perspectives, including ones I don’t share, as a survival mechanism. I remember being a homophobic future queer as a little kid, and that reminds me that our own fears can be the source of hatred and limit and manipulate our perspective, but also that people can change. I teach de-escalation, assertiveness, and self-defence skills to queer people and people of colour fairly often and everyone I work with gives me ideas. Everyday people find brilliant ways of being heard and get stronger for it, and it often starts by relating to the other person as a person first instead of an obstacle. This helps me stay grounded. I also try to give myself permission to take time and space to consider how to approach a person or respond to an issue. And once I address something the best way I can I try not to carry it around. Of course, this is all still a work in progress. Could you say a little about how you address fatness in your clinical work? Perhaps as a fat practitioner, and also with fat clients? From a purely logistical perspective I do things like use extra-wide zero gravity chairs that can support a lot of weight, but I also try to set a tone that questions people’s assumptions and labels about their own bodies and those of others, in regard to size and much more. I often hear people refer to pained part of their bodies as 'bad.' I challenge a lot of self-blaming ("I should have known better," "I was so dumb to do that.") The more I do this work the more I see that many of us are trying to atone for just being human. One thing that I like a lot about doing acupuncture is that it approaches each person as their own landscape; unique but interconnected with everyone and everything else. This means that any two people have the same acupuncture point in the same location, but for one person it might be found in a dip in their flesh and for another in a rise. It’s all about learning individual geography in the context of a shared whole. This feels right and exciting to me because it’s a model that fits everyone. Your mother sounds like quite a woman, could you tell me more about her?